Arbeitslager definition: Work camps for forced labor were guarded and movement of inmates restricted. Arbeitsziehungslager definition: Workers' Education camps - for those who broke their contracts or didn't produce their quota, needed to be re-educated. Basically punishment. Death rate high. 2) an area for the assembly of military personnel. The Nazis established 15,000 camps in occupied countries. Konzentrationlager - Under this heading, these camps were under the command of the Reichssicherheitshauptamt (RSHA) . All types of prisoners were committed: Nacht and Nebel (NN), political, Jehovah's Witness who refused to go into war labor, homosexuals, habitual criminals, Jews, and Ukrainians who helped the Jews. Later in the war workers and prisoners were treated equally poor. Death rate high. Forced labor Zwangsarbeiter - Information from the Nuremberg trials estimated that there were 12 million forced laborers. Prisoners from concentration camps and workers conscripted in occupied Poland, and Ukraine were compelled to work, on starvation rations, in agriculture, highway building and factories for the German state during World War II. Labor was also viewed as a form of killing by attrition. Forced labor was introduced for Sinti and Roma inside Nazi Germany in 1936, and after 1938. From the west they came from Belgium, the Netherlands, Luxemburg, Franch, Denmark and Norway..From the east they came from Poland, Soviet Union, the Baltic states, Hungary, Romania and Czechoslovakia. Die Situation der Zwangsarbeiter website in German, plus photos. Gemeinschaftslager - Civilian Worker Camps were unguarded communities, usually foreign workers. Jews were not the only ones earmarked for death in Hitler's Plan. All those labled at untermensch (subhuman) would be worked to death. The death count was huge in most of the concentration camps. The Nazis would require the slaves to dig ditches, trenches and the "undesirables" would be thrown in and burned. Others were sent to crematoriums. Many died of illness. Many were executed. Many starved. Some were buried alive.The undesirable were not just Jews, but Ukrainians, Polish, gypsies, homosexuals, aged, ill, intellectuals, and the list goes on. If you were of value to the Nazi's; you weren't executed, but could be worked to death. If they didn't kill you, hunger, the bitter cold, bad living conditions and typhus took its toll. Soviet prisoners of war: (computer translation) Of the 5.6 million Soviet prisoners of war, approx. 60,000 were kidnaps to Schleswig-Holstein. They stood also here in the lowest place, as in the entire Nazi ideology and in the German Reich, . They were considered as Untermensch (subhuman) absolutely, on an equal footing with the Jews, whose only existence authorization consisted of if at all, the 'dominant race' to serve up to death (i.e, worked to death). From the minutes of a general staff discussion of 13.11. 1941 over warfare against the Soviet Union. Prisons - Inmates were sent from the judicial courts, such as people's court, Volksgerichtshof. Sicherungslager / Security Camps - persons held while awaiting trial; if not cleared would be rerouted to a concentration camp or prison. Sonderlager / Special Camps - segregated for special treatment. Sentences were supposed to be short term; however, many prisoners served very long terms. Death rate high. Straflager and Strafgefangenenlager - penal or punishment camps, such as Emsland camps, more severe, similar to Konzentrationlager. German and foreign political opponents of the Nazi regime were frequently arrested and sent to jails, labor and concentration camps. Their prisoner uniform had a red triangle, often with the initial for their country of origin (P for Poland, I for Italy, OST for east, ). Wohnlager - unguarded housing communities. Although the Nizkor Project lists 4 million Russians in slave labor, it is well to remember that Ukrainians were listed as Russian while under USSR rule. Hitler occupied Ukraine for 3 years (1941-1944) going door to door, ordering Ukrainians into conscripted servitude, prior to any direct invasion on Russia proper. 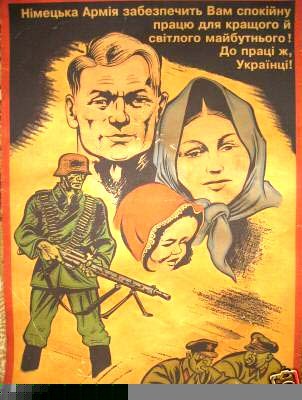 Here is poster calling Ukrainians to come work in Germany for the war effort. It wasn't so difficult for Ukrainians to work for Germany because they hated Stalin. Previously in 1932-33 Stalin killed off 10 million Ukrainians in the orchestrated Famine-Genocide, denying the famine and not allowing food to come in. Nazi's promised them an independent Ukraine. The posters shows the Nazi army pushing back the Reds. To bleed from the mouth for no reason. In the yard between the barracks. Under the bed) and then another. They knew he wasn't a German. Take it, this is the money they owe you." As the beets she had to dig everyday. My father tried to carry some on his back. Maybe from drinking the dirty water. With priests and girls and boys. And cutting them in secret places. Were like buffaloes: terrible and big. Her labors. She wonders if there is a God. Jar loose from its frozen pause. Redder than a big man's kidney or heart. And cold, but not soft, never soft. She knew they would beat her. The leather fist in her face above her eye. And her mother and the baby. In the spring when the war ended. And there is never enough to eat. The winter even if you survive the fall. Are scarce like chickens and bread. Cannot bear the sorrows God gives them. Your enemies will not torment you. You only pray that they will not kill you. I've started a blog about my parents and their experiences in the slave labor camps in Germany, and later their experiencs in the US as DPs. I've posted about why I write about them, about how they came to America, about what it was like in the DP camps after the war. BERLIN (AP) — The names of some 3.5 million people displaced after World War II have been provided to Holocaust memorial groups and museums in the United States, Israel and Poland by a recently opened archive of Nazi-era documents. The International Tracing Service of the International Committee of the Red Cross said Tuesday that it had handed over a third round of digitally copied documents to the Yad Vashem Memorial in Jerusalem, the U.S. Holocaust Memorial Museum in Washington and the Warsaw-based National Institute of Remembrance. 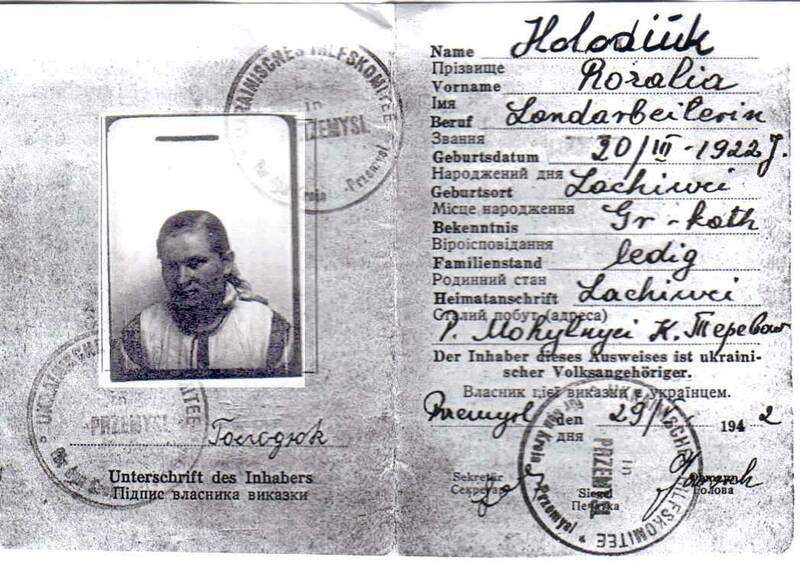 The archive, based in Bad Arolsen, Germany, said the transfer involved copies of index cards that feature the names of people who were freed from Nazi concentration and labor camps as well as prisoners of war. "It is essential that we can share, thanks to the opening of the archives, our documentation on the fate suffered by the victims of the Nazi regime," said Reto Meister, the ITS director. "This will facilitate access to the information that is of such great value to the victims and their families, irrespective of whether they live in Europe, Israel or America." There are millions of index cards, documents and files in the ITS archive, some of which contain detailed family histories. The archive made its first distribution of copied documents late last year, to make access easier for family members, friends and now researchers. For more than 60 years, the information was locked away in the secretive archive, which houses records scooped up by Allied troops from concentration camps, Nazi SS offices and postwar displaced-persons compounds. It will take the ITS two more years to finish copying onto hard drives the 16 linear miles of papers that fill a half dozen buildings. So far, around 67 million images of documents have been transferred to the memorials and museums. Sharing the files will allow survivors and victims' relatives to see true images of documents — transportation lists, Gestapo orders, camp registers, slave labor booklets, death books — that demonstrate their tortures and that may have determined whether they lived or died. The characterization of forced labor as more humane than slave labor is a relative one: for example, while female forced laborers at Volkswagen were treated better than concentration camp inmates, forced laborers' infants were taken from them and kept in an unheated, bug-infested nursery, where nearly all of them died from neglect. Because Calif. Stats. 1999, Ch. 216, covers companies using both slave and forced labor, the Social Issues Service uses the term forced labor as an inclusive term, describing labor that may have been forced or slave. The term forced appears in this report only in cases where companies described their laborers as slave laborers to the Social Issues Service; however, in some cases this may be the result of the language barrier rather than an indication that slave, as opposed to forced, labor was used. Most were very young, under the age of 16, as those older than 16 were usually conscripted. 30% were as young as 14 years of age when they were taken to Germany. By November 1943 the age limit was dropped to 10. 50% of those taken from Ukraine were girls and women. OST-Arbeiters from Reichskommissariat Ukraine were forced to wear a dark blue and white badge with "OST", the German word for East. What the nations can offer in the way of good blood of our type, we will take, if necessary by kidnapping their children and raising them here with us. Researchers from the United States Holocaust Memorial Museum have concluded that over 40,000 Nazi camps and ghettos existed during Hitler's reign of terror between 1933 to 1945. The total is far higher than most historians had previously estimated, according to The New York Times. Geoffrey Megargee and Martin Dean, the lead editors of the project, have compiled the thousands of sites in a multivolume encyclopedia that is being published by the Holocaust Museum. Each volume catalogs thousands of sites, providing a comprehensive history of the "living and working conditions, activities of the Jewish councils, Jewish responses to persecution, demographic changes, and details of the liquidation of the ghettos." The Holocaust Museum team also created maps of the sites, which were scattered across Europe, and which imprisoned or killed between 15 and 20 million people [not just Jews]. Essentially, this study shows the Holocaust was far more extensive than even historians comprehended. Hartmut Berghoff, director of the German Historical Institute, said the research is simply astounding, reports The Times. "We knew before how horrible life in the camps and ghettos was," he said, "but the numbers are unbelievable." The researchers' work may also help Holocaust survivors attempting to sue insurance companies or recover stolen property. "How many claims have been rejected because the victims were in a camp that we didn't even know about?" said Sam Dubbin, a lawyer who represents survivors. Over the years, many scholars have worked to uncover the lost or unknown victims of the Holocaust, and some have insisted the death toll is higher than what the textbooks say. The number of Jews killed is often listed at around six million. Father Patrick Desbois told the London Times in 2009 that after years of investigating mass graves in Ukraine, [Olga's npte: mass graves in Ukraine include ten million of Ukrainians killed by Nazis and Stalin and not just Jews.] he feels the death toll should be revised upward. This latest research is yet another piece of evidence that can be used to refute the fringe movement that continues to deny the Holocaust took place, or that its terrible legacy has been exaggerated for political gain.